Recently I had the opportunity to attend a dinner to celebrate the onset of Fall and all of the delicious foods and libations that accompany the season. Fountainhead is a Ravenswood neighborhood gastropub that perfectly exemplifies this feeling in both décor and ambiance. I was a guest for the Harvest Dinner on the Roof Deck: A Night with Angel’s Envy and Metropolitan, and it was a splendid way to enter "comfort food" season. Chris Kafcas (Front of House Manager) and Cleetus Friedman (Executive Chef) at Fountainhead gave a warm welcome and relayed their reasons for having such a dinner. Everyone has a fondness for Fall, but one of the special attributes the season imparts is a warmth and fellowship in gathering people together around comforting foods and perfectly-paired libations. With that in mind, and the plates of food beginning to arrive from the kitchen, Chris first introduced Doug Hurst from Metropolitan Brewing. Doug gave a quick synopsis of Metropolitan and its German lager-style brewing philosophy. In fact, Metropolitan has been instrumental in guiding many of the new Chicago craft breweries as they have been starting out. As Doug was speaking the plates were arriving and set before us. Piles of bone marrow with Herbes de Provence, pickled vegetables and fruit mostarda. This was paired with Metropolitan’s Dynamo Copper Lager. Its copper hue comes from a wonderful balance of 2 kinds of hops and Vienna malts. The next two family-style dishes were superb! Hearty strips of kale, butter-roasted sunchoke, toasted sunflower seeds and onion frizzles coated in an apple sunflower vinaigrette. Also, a brussel sprout and delicata squash hash in a warm drizzle of nutmeg brown butter. These two sides were perfect examples of what Fall vegetables provide in terms of freshness and flavors. For this particular dinner, three of our beer pairings would be served at cask temperature. Normally I am not partial to this, but suffice it to say, I would be a complete convert by the end of the dinner. A Metropolitan dry-hopped cask with beautiful notes of grapefruit and a collaboration American IPA cask with Lake Effect Brewing called 27 Blocks. Last but not least, a black pepper cask version of Dynamo that was, in my humble opinion, one of the best session beers I have ever tasted. It was a sublime pairing with the herbed roast beef and horseradish cream, which was the main entrée. It was at this point, nearing the dessert phase of the dinner, when the representative from Angel’s Envy, Joe Nelson, was introduced. 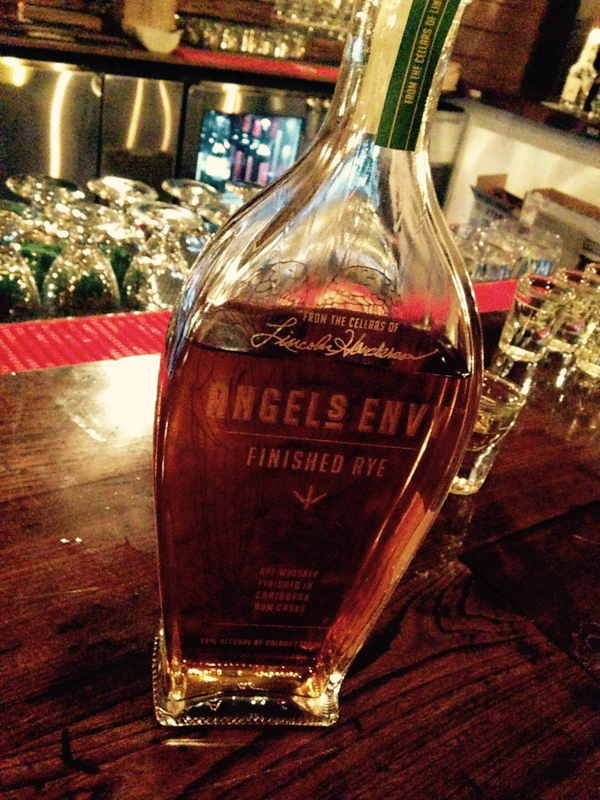 He gave an impassioned story of the founder of Angel’s Envy—Lincoln Henderson—who recently passed away and was the guiding passion behind this exemplary whiskey. We tasted their cornerstone bourbon, Angel’s Envy Port Finished Bourbon, which is aged in port casks – along with a Fonseca tawny port to compare and contrast subtleties of flavors imparted in each. Paired with the delicate caramel apple bread pudding as the last course of the dinner could not have been a wiser choice. As the plates were being cleared from the tables, Joe invited all of us to sample some rarefied examples of their cask strength bourbon flagship which won the Best Spirit in the World in 2013 by the Spirit Journal. Also, a particular highlight for me was their Rye finished in Plantation XO barrels. To a rye and rum aficionado such as myself, this was a perfect ending to a spectacular evening. All in all, the attendees of this dinner were left with not only the warmth of the spectacular food and libations, but also the embracing atmosphere created by Fountainhead, Angel’s Envy and Metropolitan. Rest assured if they collaborate again, it will surely be an event not to be missed.